Warmonger Miniatures is running our sixth Kickstarter. Help us add this one to our list of success stories (Great Swords, Arquebusiers, Crossbowmen, Halberdiers and Reiter). In a nutshell, I'm a Warmaster gamer who's after a Dogs of War army where I don't have to worry about out-of-production models, conversions and size differences between ranges. 10mm Landsknechte fit the bill here, plus they could find a home in an Empire or historical army as well. 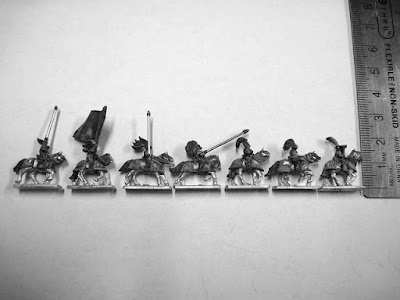 Each unit of ritter is made up of twelve strips (12 figures total) you'll get one hero (the one with the raised lance) and one standard bearer strip each, and ten rank and file strips randomly selected from the other five strips pictured below. The figures are designed to fit on 20x40mm bases without too much of the figures hanging over (for easy ranking and base contact). $12.00 per extra unit if you pledged at the "Donation" or "2 Units" levels. $11.25 per extra unit if you pledged at the "4 Units" level. $10.75 per extra unit if you pledged at the "8 Units" level. Bases will not be available this time as I can no longer source them locally. Once the units are ready to be shipped I will invoice you for an additional fee to cover postage (you can also add additional landsknecht units at this point too). Please note that these are estimates. I was liberal when calculating the weight of the units so hopefully they won't be higher. Add-ons will affect the cost of postage. $4.00 for 1 to 4 units. $7.50 for 5 to 32 units. $14.50 for 33 or more units. $15 for 1 to 4 units. $24 for 5 to 22 units. $37 for 23 to 54 units. $60 for 55 or more units. The ritter are sculpted and a master mold has been cut. If this Kickstarter fails to be funded I will still produce them just at a later date (after I've recouped some of the costs from other sales). In terms of a time-frame, I figure production molding and casting in December, and shipping in January. If that changes you'll be seeing an update from me here.